14ymedio, Mario J. Penton, Miami, 6 February 2017 – Two dozen health professionals who abandoned their Cuban medical missions abroad arrived this afternoon at the Miami International Airport from Colombia. 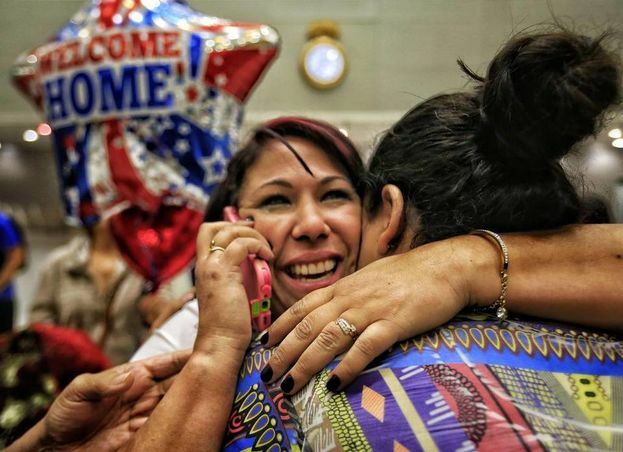 This is the first group to arrive in the United States after the end of the Cuban Medical Professional Parole (CMPP). “This is a triumph for the whole Cuban American community, our organization and the offices of the Cuban American congressmen who have worked so that these guys can get the right deal, and their petitions were satisfactorily answered,” said Julio Cesar Alfonso, president of the organization Solidarity Without Borders (SSF) which supports Cuban doctors. Yerenia Cedeno, a 28-year old Cuban doctor, characterized the situation they experienced in Venezuela as “horrible.” She escaped five months after arriving at the mission, pushed by insecurity and the precarious conditions where they worked. “You would find out that they took the phone from this one or robbed that one on the minibus. It’s horrible,” explains Cedeno. “They put you in another place, not in your job because they look down on you because you don’t agree with what you experienced and for what you were badly prepared,” she adds. The doctor felt exploited in Venezuela, where she shared her work with her husband, also a doctor, who accompanied her on her trip to the United States but did not want to make a statement to the press. Their plan is to take their little three-year old daughter who lives in Guantanamo out of Cuba and resume their studies in the United States. “I want to work as a doctor or something similar. This is the start of a new life,” she says. This past January 12, the then-president of the United States, Barack Obama, eliminated the CMPP, a program established under the administration of Republican George Bush that in a decade allowed the flight of more than 8,000 Cuban health professionals. According to the non-profit organization Solidarity Without Borders, which helps integrate these doctors into the US health system, it helps those fleeing from the biggest human trafficking system in the modern history of the western hemisphere. Arisdelqui Mora, a young Cuban who escaped the Island four years ago on a raft, waited for her half-sister Arianna Reyes, a Cuban doctor who escaped from the mission in Venezuela. The happiness of the reunion, which included the grandmother of both, received wide media coverage. “We have been separated but during the whole time we remained in communication through the networks,” explains Mora to 14ymedio. “They have worked a lot,” she adds. Celia Santana, a dentist, only spent five months in Venezuela. “Venezuela is much worse than my country. I never imagined that it would be like that. That country is a disaster, and of course the Venezuelan people are not to blame,” explains the doctor. She spent five months awaiting the parole in order to travel to the United States. “It’s absurd to end the program. They should have taken other measures,” she says. Mildre Ester Martinez, recently arrived in Miami, appreciates the help received through the media and the service of Solidarity Without Borders. “I did not feel right. I was disgusted, disappointed by all the work we did there. I thank God to be here,” she added. Health worker Veidy Diaz, from Cuba, is received by her family and friends on arriving at MIA from Colombia (NH). Palacios also questioned the supposed good will of the Island’s government when the official communication from the Minister of Public Health did not mention the frozen bank accounts that the aid workers lose once they abandon the mission. “They don’t talk about the money. There are people who have up to 7,000 dollars, and they lose it all the day they decide to escape,” he said. The Cuban government appropriates two-thirds of the salary earned by the Cubans abroad. They are generally sent to the most remote places in deplorable working conditions. In countries like Brazil they do not have the right to receive their family while the aid program lasts, even though the laws of that country permit it. Solidarity Without Borders is in the middle of a campaign to re-establish the Parole program for Cuban doctors. Currently they are working with the offices of Cuban American congressmen in order to present a proposal to President Donald Trump to reinstate the CMPP. “We will keep working so that our colleagues may reach the land of freedom and in the near future the Parole program will be re-established for professionals who are in third countries,” explained the president of SSF, Julio Cesar Alfonso. According to statistics from SSF more than 69 Cuban doctors have been killed in Venezuela in the last 10 years. The Cuban government has divulged that currently more than 50,000 professionals from the Island are dispersed throughout more than 60 countries worldwide. Working conditions and political pressure push thousands of professionals to accept the missions proposed by the Cuban government. Even though the salary was increased in 2014, the average salary of a doctor in Cuba is about 60 dollars a month. The massive exportation of health services has generated income for the government on the order of 8.2 billion dollars a year in 2014 according to official sources.